Bazm-e-Iqbal: How would Taliban deal with swine flu! How would Taliban deal with swine flu! Reaction of some governments and international agencies in response to swine flu has resulted in some raised eyebrows and voices. Governments and international organisations around the world are doing everything they can to rename swine flu in order to protect the pig farming industry from harmful effects of ordinary people from staying away from pork. According to New York Times, Thailand, one of the largest meat exporters in the world is already referring to the disease as "Mexican flu". The World Organization for Animal Health, which handles veterinary issues around the world, wants it to be called the "North American influenza". The US officials are going out of their way to call it by its scientific name, the "H1N1 virus." The World Health Organisation stated that from April 30, it would stop naming it "swine flu" and start naming it "influenza A(H1N1)". UN Food and Agriculture Organisation is "mobilising a team of experts to assist government efforts to protect the pig sector from the novel H1N1 virus by confirming there is no direct link to pigs." A spokesperson for the EU commented "I would suggest that you call it 'novel flu virus' just to avoid the misunderstandings with the animal diseases because it costs a lot to the industry". In an environment where majority of governments are trying to change the name of the virus to save the pig farming industry, more interesting reaction is coming from governments who looked at the problem from a religious perspective. 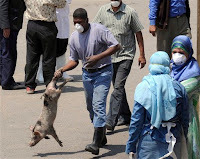 Egypt, a primarily Muslim country, has begun slaughtering over 300,000 pigs farmed by Christian minority in the country. It is public knowledge that swine flu though originated from pig farms of Mexico is now spreading across the world through human to human contact but the Egyptians have decided to rid the country of pigs in one fell swoop. In Israel "An Israeli deputy health minister - an ultra-Orthodox Jew - said his country would re-brand the swine flu virus as the "Mexican Flu", to keep Jews from having to say the word "swine." In orthodox Islam using the words "pig" or "swine" is equally unacceptable hence I wait for the Islamic world to follow Israel's policy. I wonder how Taliban from North of Pakistan are going to react to this "infidel" disease that the great Satan America has unleashed on the world through its pig farms in Mexico! Would a human being infected with virus with its origin in pigs is going to be branded an infidel! Hands off our democracy, Mr. Obama!